Continuous improvement in cutting tool designs, has always been a key contributor to optimizing machine performance. Tool holder innovation has also improved design flexibility of the entire tooling solution. ETP Sweden has been assisting tool manufacturers for decades to promote accuracy and flexibility on various CNC routers. Traditionally, tool holders have been assembled with router bits and cutter heads separately. However recent innovations have made it possible to install cutter heads and router bits on the same tool holder. Image 1 shows a traditional G2 style hydraulic holder, which has been used for decades in wood and metal markets. This holding solution utilizes hydraulic pressure to clamp the router bit with optimal accuracy, rigidity and balance. The yellow areas in image represent hydraulic grease, surrounding the cutting tool, and separated only by a thin wall inside the tool holder. When the grease is pressurized by turning the actuator screw, it clamps a shank of router bit with maximum accuracy and clamping force. Hydraulic tool-holding systems effectively eliminate the need for mechanical spring collets, which have inherent accuracy and clamping force limitations. ETP G2 hydraulic holders have been used in metal and wood machining applications for decades with tremendous success. Recently, a new innovative design has further improved G2 hydro performance by creating a more flexible interface which can accommodate multiple tools. Image 2 demonstrates the “multi -tool” concept know as “G2 combo” units. These units utilize the same precision clamping technology as the traditional G2 products to clamp the router tool shank. However, the image also shows a profile cutter, mounted between the router bit and the HSK connection to the spindle. This holder design allows the CNC router to machine with two separate tools on the same holder. 5-axis machines provide flexibility and many options for multiple applications on a single spindle machine. ETP G2 combo units further increase flexibility and efficiency, by eliminating the need for tool changes. The ability to rotate spindle position with a cutter and router tool on one holder, provides an incredible advantage. A router bit can be used for traditional machining, then rotate the spindle to use a profile cutter head to machine specific profiles, which are impossible to machine with router bits. Aggregates have been used for years to allow CNC machines to cut from vertical and horizontal orientations, and 5 axis technology has made this easier in many ways. The invention of ETP G2 combo now provides the ultimate flexibility for machining from multiple orientations. Cycle time advantages can often be gained by using a saw blade for straight cutting and router bit for profile machining. The G2 combo unit allows both operations to be performed on the same holder. Often, narrow grooves are very difficult to achieve with small diameter router bits. A saw blade mounted on the G2 combo unit can provide the ability for traditional routing and narrow grooving operations with a saw blade on the same holder. Mortise and tenon joints obviously require two tools to achieve a proper joint. Traditionally, tools have been run on separate holders and spindles which does limit cycle time, as a tool change is required. The G2 combo system allows both tools and operations to be done with one holder. This application has grown in popularity on 5-axis machinery, and the new ETP G2 combo unit can increase efficiency for mortise and tenon joinery. Image 3 shows a mortise and tenon tool mounted on a G2 Combo unit. This allows for set up of a short mortise tool, projecting from the end of hydro holder, and a larger cutter head held below the spindle interface, to machine the tenon portion of the profile. With the proper set up and clamping locations, this will allow complete mortise and tenon joints to be machined in one operation without a tool change required. Before adopting this technology, there are some important factors which must be considered. Router tool projection from bottom of tool holder is a critical consideration to avoid tool collisions with pods, clamps, or other parts on the machine. As illustrated in the mortise and tenon example above, the router tool must be relatively short to avoid collision with material or clamps, when machining tenon portion of the profile. G2 combo units likely integrate best on POD machines, but nested machines are not out of the question. However, many nesting machines do have smaller tool diameter limitations, so careful consideration of cutter head diameter must be made. Furthermore, the projection of tool below the part is obviously not possible on nested machines, but the immergence of nested and POD combination machines does make the G2 combo unit a great option is many cases. 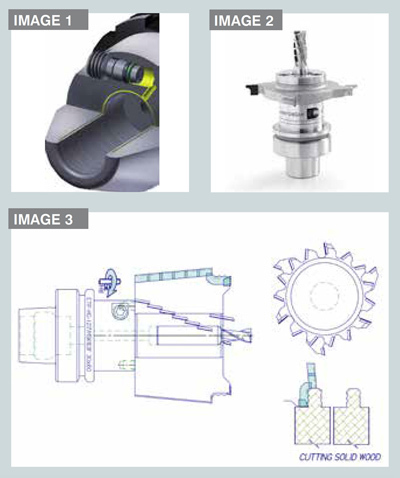 Tool holding systems provide a key point of connection between machine spindle and cutting tool. Tool holder manufacturers have been improving tool accuracy for many years. Introduction of hydraulic holding technology, to replace traditional mechanical collet holding systems, has improved tool and machine performance. The invention of ETP G2 Combo units has provided flexibility benefits, which will further optimize machine performance. Tool manufacturers now have a valuable option to hold more tools on one spindle and provide machine programmers with added flexibility when programming tool paths. This added flexibility will undoubtably lead to more creative tool designs and programming techniques in the coming years.